UPDATE: This article has been updated to include a second test performed by Jason Porter on Sept 18th, 2017. The additional test has been added to the bottom of this post. A year ago IKEA came out with a new AA/AAA Rechargeable battery that was sporting some nice stats. A lot of people were skeptical at first but a few people gave them a try. It makes sense to by skeptical, they are $7 for a 4 pack. At first alot of people figured the specs were a lie. 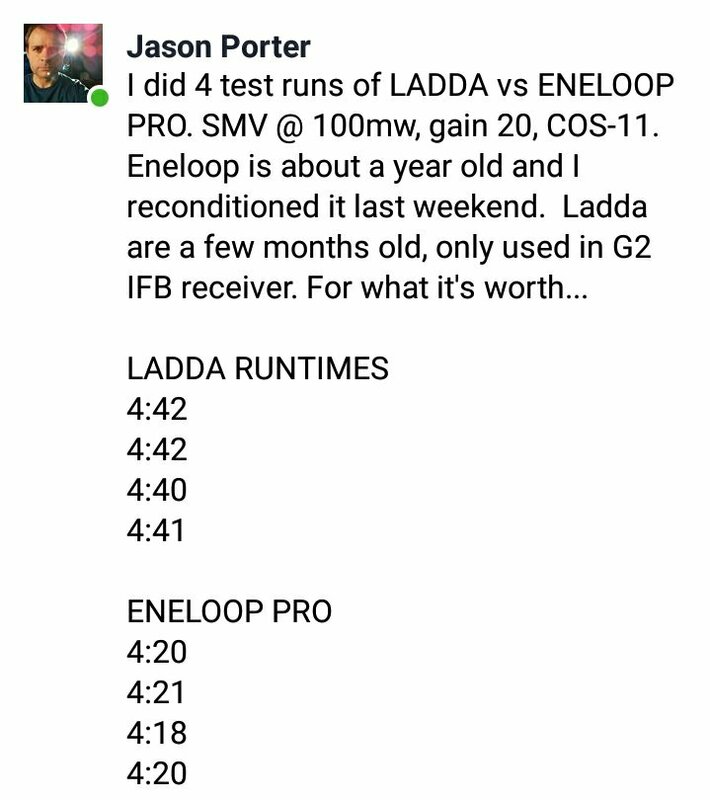 I mean when you consider that Eneloop Pro batteries are 2550mAh and cost nearly three times the price. So I started to investigate the IKEA battery about 2 months ago. I polled some soundies and Chicago sound mixer Carlos Meada helped me make some big discoveries. First we should examine the specs of the IKEA batteries. If those specs look familiar its because those are the specs for the Eneloop Pro batteries. On the batteries themselves they only seem to make the claim of 2450mAh… same as the IKEA batteries. And 500 cycles lifespan is the same stat too. You can see the full spec list for the Eneloop Pro on their Amazon page HERE. But the most interesting stat is the fact that both batteries are produced in Japan. Why is that the most interesting fact? Well that is because there is only one factory in all of Japan that can make LSD Ni-MH (Low Self-Discharge nickel–metal hydride) and that is FDK. FDK is a OEM manufacturer for other brands. In fact if you wanted to start you own battery brand all you would have to do is contact FDK’s sales office and become a client. They would point you to their catalog of offerings but you don’t need to look through it. Just ask for the FDK HR-AU. 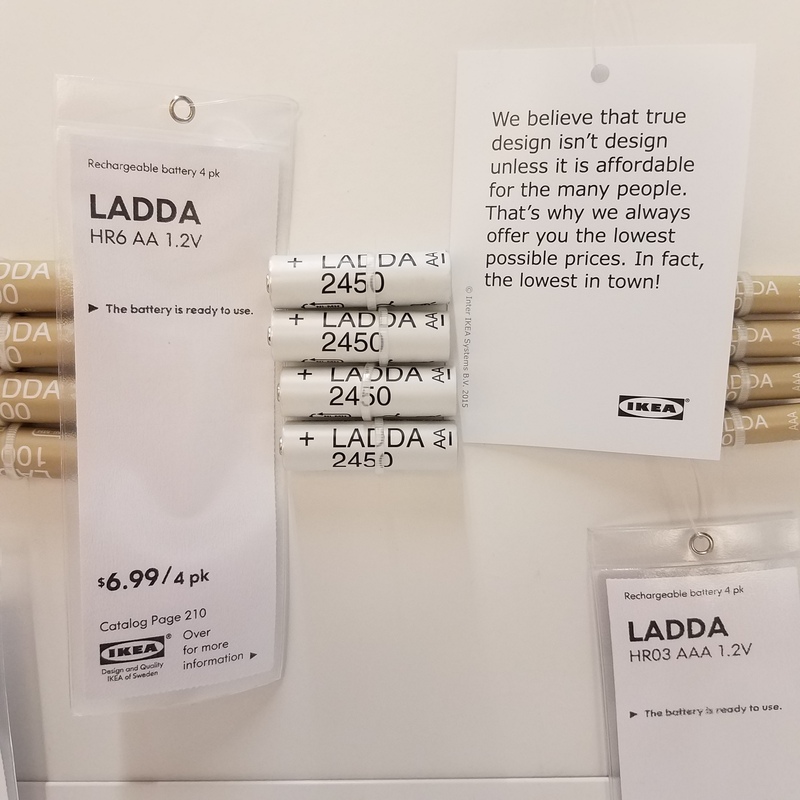 They are cheaper by a lot but most of that is due to the fact that IKEA has global purchasing power, a built-in international distribution chains already in place for their other products, they own their own retail locations (Almost vertical manufacturing), and zero advertising attached to this product. IKEA also is a company that is big into renewable engery and low power electronics. I operated sound for a video that was being shot at the construction site of the new IKEA in Burbank and the rep from IKEA wanted to highlight their commitment to the environment during his sound bites. The Burbank store is the largest in the world and runs 100% on solar panels located on it’s roof and parking garage. So these batteries could also be cheap because IKEA believes it is morally obligation to make them affordable to all consumers? Not a crazy theory. But as for them being below spec… no. Remember how I began this article by saying Chicago sound mixer Carlos Meada was the key to the big break in researching these batteries? No? I’m pretty sure I wrote that. Well he purchased 72 batteries and ran extensive test on them to measure their capacities and did some runtime test. His findings discovered that the average capacity for a AA was 2493mAh. Not a single battery tested under 2450mAh. Average voltage was 1.44V. And when running runtime test in a Zaxcom TRXLA they averaged over 5hrs of runtime. For a full breakdown of his finding here is a link to his research. He put it all into a easy to read spreadsheet. UPDATE: Jason Porter has also done his own test and found that they preform nearly identical. It has also been pointed out that the white matte finish on the IKEA LADDA allow you to write in Sharpie on them. You can write information like purchase date or a fake serial number for your own inventory. Not a tradition way to evaluate if a AA is good but it is a nice bonus feature! Overall it’s safe to say these are a great buy! It’s now much harder to justify the cost of Eneloop Pros. Some have pointed out the IKEA batteries do need time to be conditioned unlike the Eneloop, but that after conditioning they act identical. Maybe Eneloop Pros are preconditioned before packaging??? Maybe? But IKEA also sells a smart battery charger that will condition them and charge these AA the way they want to be juiced. I switched to all LADDA batteries two months ago and I’ve been super happy with the results when used with the Sennheiser wireless. They will run my transmitters all day; What more could I ask for? If you found this article helpful and I just saved you $20 on a 4-pack of batteries, help us out. Donate a little so we can continue to provide articles like this one. Next Next post: K-Tek Stingray Harness overview and how-to guide. 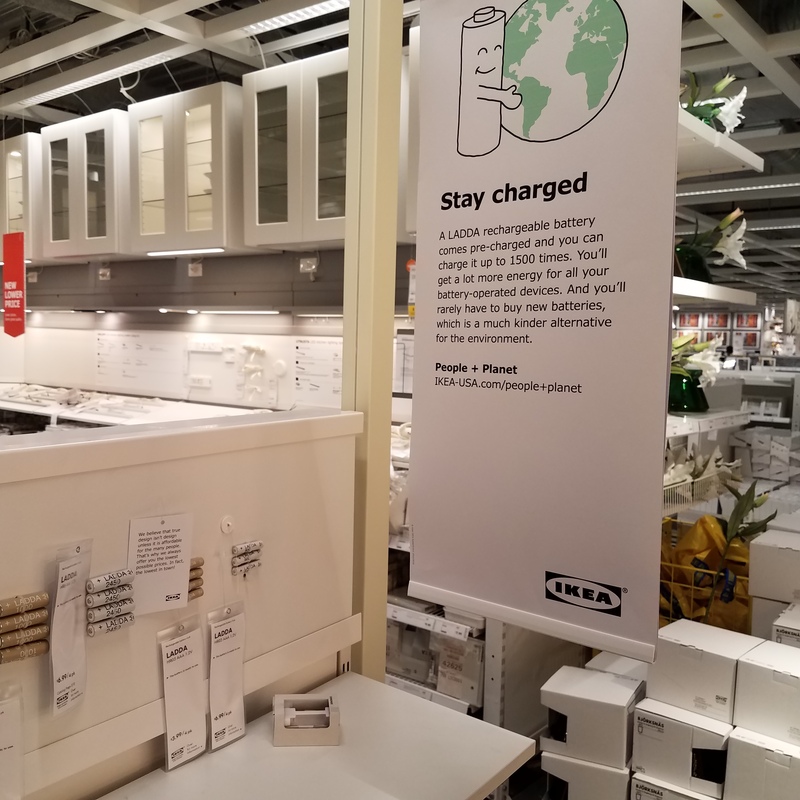 Do you know if standard recharging sockets will recharge the IKEA batteries? Standard what? Like you mean other NiMH AA chargers? I mean standard recharging units. I bought the IKEA batteries (but not the unit for recharging) but they don’t seem to be recharging in generic recharging unit. How long does your wireless last with ( I suppose) 2 of these AA in it ? I have XDV75 bodypack from line 6 and I have tested it to run 7h30 before it warn for low bat. “NiMH (nickel metal hydride) batteries in the 2400 – 2800 mAh range are recommended as rechargeable batteries to use with the THH12 and TBP12 transmitters. Make sure that the batteries t properly in the battery compartments to prevent damage, since these batteries can vary in diameter and length. They need to be charged in the correct external battery charger; the transmitters are not designed for batteries to be charged internally. Because the transmitter’s battery meter was calibrated for alkaline batteries, they will not be as accurate in calculating the remaining battery life when using rechargeable batteries. It seems your transmitter can no give you the proper reading for NiMH batteries no matter which brand you end up choosing.